Let’s face it, Gibson Guitars’ Zoot Suit SG maybe the ugliest guitar we’ve seen in the last several years. But sometimes ugly is cool. Cherry Poppin’ Daddies‘ leader Steve Perry has teamed up with the legendary manufacturer to take blame for this beauty. The Zoot Suit SG is a “guitar that’s made quite a colorful statement to guitarists and music fans alike with its unique and radical appearance,” according to the press materials. 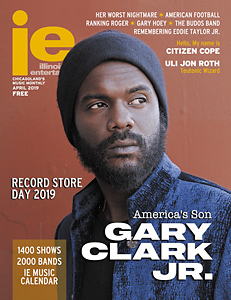 And, like a good endorsee, Perry will perform with his eh, one-of-a-kind axe in front his fans on their ffall tour in support their album releases, Susque-hanna and Skaboy JFK. 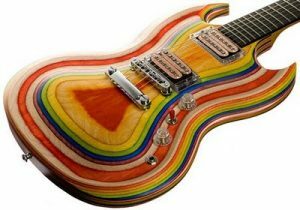 Inspired by the word Zoot – a vintage term coined by ’20s jazzbos meaning extravagant style – the guitar features unique coloration achieved by dyed pieces of wood as opposed to paint. The piece also includes a multicolored neck and is available in five dizzying combinations: rainbow, black and red, black and white, black and natural, and red and blue. Gibson is offering the guitar in limited quantities, and list price is $1,999. Head online for more details and specifications at www.gibson.com. Longtime home-studio boffins Tascam has released its VL-M3, a new pair of extremely affordable stereo monitors for beginning home recording, computer use, and mixing. The monitors feature a 3-inch driver with a front-mounted bass port and built-in 24-watt stereo power amplifier. In addition to being a user-friendly solution for beginners and musicians on a budget, the VL-M3s provide a realistic reference for music and post playback. Like they did 20 years ago with its Portastudio 4 track machines, Tascam is making these monitors exceptionally purchaseable at a price of $99. Visit www.tascam.com for details. In response to requests from cash-starved musicians, Vox amps has released its pocketbook-friendly new V845 Wah Wah Pedal. Sonically, the V845 preserves the spirit and tone of the early VOX wahs, a sound that’s been sought by several generations of musicians. Designed to withstand the beatings gear takes on the road, the V845 features a solid yet lightweight diecast aluminum body, as found on vintage Vox wah pedals from the 1960s as played by Jimi Hendrix, The Beatles, and The Who. Vox invented the world’s first wah-wah effect pedal then and guitar wankers have never been the same. The unmistakable sound has been heard on countless rock recordings and liquor-stoked live performances, not to mention every Kirk Hammett solo since ’91. The V845 Wah Pedal checks in with a retail price of $155. Hatched in 19th century Haw-aii and popularized again the ’60s by comedian Tiny Tim and in the ’90s by George Harrison and Tom Petty, Ibanez is offering five different soprano and concert-size ukulele models that include its flagship koa soprano UKS50 to an entry-level sapele-bodied soprano UKS10. Highline models (the UKS50, UEW20SG, and UEW10QM) feature Grover tuners, abalone rosettes, natural high-gloss finishes, and padded gig bags. Entry-level models, the UKC10 and UKS10, feature open-gear chrome tuners, natural low-gloss finishes, and gig bags. Prices range from $100 to $250. Visit www.ibanez.com to keep learning.